Stainless Steel waterproof enclosure 20½ x 8 x 2. 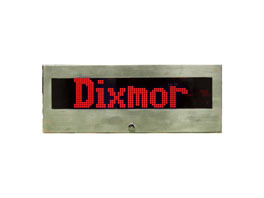 Giant dot matrix display 3 x 18. Each Message can be 128 Characters long. Change messages with a switch closure. Default message displays time and date. Can be programmed with pushbuttons or remote control. Available with RS-232 serial communications input (special order).